For a description of our current programs please click on the “+” sign next to each header. 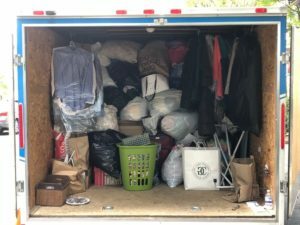 The Annual Clothing Drive held in the Summer benefits the Society of St. Vincent de Paul. Each Spring we sponsor a non-perishable food drive event; donations and monetary contributions support Catholic Charities emergency food pantry. 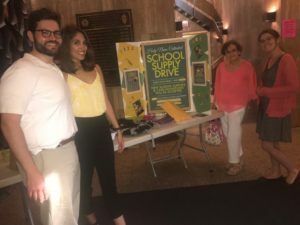 Our annual appeal for school supplies and monetary donations contribute to Chicago Archdiocese Schools; The Academy of St. Benedict the African and Our Lady of Tepeyac. 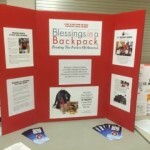 St. Benedict students write prayers to purchase supplies. Each week volunteers pack over 225 bags with kid-friendly, nutritious, non-perishable food to help ensure impoverished elementary school children at St. Malachy’s have food on the weekends through the school year. Our Mission is to help talented professionals find jobs in the community. If you are an employer, job seeker or advocate, visit holynamecareernetwork.org for more information. Share professional-level (accountants, lawyers, etc.) job listings at your company/organization with our network. Provide valuable insight on available positions, your company culture and the hiring process with candidates. Share your knowledge about career development and networking skills at one of our monthly meetings which occur the second Thursday of every month. The suppers are free for the guests but the cost of providing them is approximately $1,000 each night. Donations to support this ministry can be made by dropping off a check at the Rectory. The check should be made out to Holy Name Cathedral in an envelope marked Thursday-Friday Suppers. Your generosity is appreciated by 210 guests fed each night. This HCC sponsored program helps local Chicagoans (with incomes less than $50,000) file their income taxes. Tax services are offered on Saturday from February through mid-April. In 2018, our VITA program prepared 191 tax returns. Refunds from the federal government totaled $137,190 and refunds from the state of Illinois totaled $11,349. This assistance is available in 2019. Please see the Human Concerns page of the Bulletin for details. 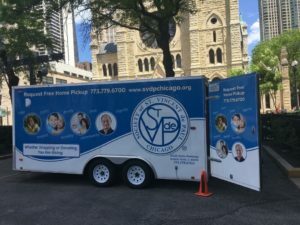 Our thanks to the volunteers who worked to make this service available. We plan to offer VITA again in 2019 (for tax year 2018). At that time, we will be seeking volunteers. Information about how the program works is below. Tax preparer volunteers, especially those with some accounting experience, are needed. Participation in formal training and IRS certification will be required. Intake volunteers are also needed to greet clients and review documentation. No certification required. Volunteers may assist as many Saturdays as they wish. Clients must bring a government-issued photo ID and social security card for individuals listed on the tax returns, including dependents. 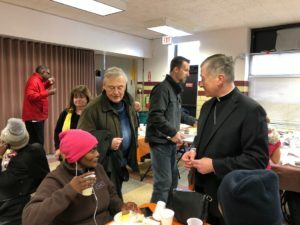 We coordinate mulit-component experience to honor Pope Francis’ invitation to “create moments of encounter and friendship, solidarity and concrete assistance” for the poor. 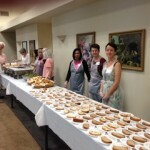 The invitation welcomes those less fortunate as honored guests to break bread at Christ’s table. This year’s effort provided 100 flu shots, served 150 guests a hot meal, and distributed 100 lunch bags to homeless in our community.